Based on research findings concerning the DEAF-WORLD, rich in examples from the lives of Deaf people, Journey is a “must read” for professionals and students in such fields as audiology; speech-language pathology; medicine; education; school, rehabilitation and mental health counseling; psychology; interpreting; ASL and Deaf Studies; and for anyone with a Deaf person in his or her life. I bought this book for my Deaf Culture class and I am very glad that this was required reading. Although I have been taking ASL classes for 10 years and have been involved in the Deaf community I still found this book to be very eyeopening. I highly recommend this book to everyone. It is well written with good flow and gives insight to the Deaf perspective. I am loving this book. I am currently studying ASL in college and this book has great insight into the deaf world and how life is different for deaf people. 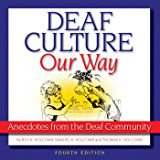 Would definitely recommend to anyone wanting to know more about deaf culture or just deaf people in general. Really opened my eyes. This book is just excellent to take one into another world, a world that is closed to most of us in hearing world, that of the Deaf. It has made me sensitive to this other language group and its rich history and culture. The intro to sign to oral education and all its associated parameters and issues was most enlightening, taking one right up to current mainstreaming emphasis. It is well written, organized, flows well and is just a delight to read. Certainly this is a major resource to understand this neglected and misunderstood group of fascinating humans. This book certainly will raise one's consciousness and passion for this in many cases neglected area of our society. This book is the only passport you will need to travel to the heretofore not-very-well-if-ever-at-all understood Deaf-World. 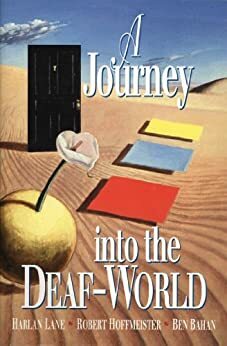 Well written, "Journey into the Deaf-World" is quite exhaustive in its coverage of the the life and times of Deaf people in America. From culture to education and everywhere in between, "Journey" is as much enlightening as it is enraging. You will find yourself newly aware of sad injustices and lack of understanding the confront the the Deaf community at every turn. While not always an easy read, one must give credit to the authors for making what could have been a cumbersome text into a scholarly-yet-accessible book. Especially enjoyable are the examples of real-life situations that Deaf people encounter. For instance, when the sections on education are covered, "Journey" examines the different methods of attack used by various educational professionals over the years, effectively giving a well-rounded picture of the educational scene from the Deaf perspective. But when it gives a series of mock narratives of the typical experience of a Deaf child in each of these methods of teaching, the reader is able to experience what can only be described as true enlightenment. Don't be intimidated by the book's thickness. If you have any tie to the Deaf-World,or even just a passing interest, "Journey" will take you for a fast-paced ride you'll not soon forget.